The upcoming 2020 Census enumeration process will directly impact and define our communities for the next decade. Census Bureau figures are used for the appropriation of federal funds, the apportionment of US House of Representative seats, state legislature and other local entities representation. Additionally, Census Bureau figures are now commonly used by many in the public and private sector for business decisions that impact our future growth. A Complete Count Committee (CCC) is comprised of a broad spectrum of government and community leaders from education, business, healthcare, and other community organizations. These trusted voices develop and implement a 2020 Census awareness campaign based upon their knowledge of the local community to encourage a response. The primary goal of the 2020 Census is to count everyone once, only once, and in the right place. Each of the four Counties in the SEAGO region have formed a CCC for their county and will be working with cities and towns in their region to coordinate local efforts to raise awareness and make sure everyone is counted! FEB. 28, 2019 — The U.S. Census Bureau has released the 2020 Type of Enumeration Area (TEA) Viewer. The TEA Viewer is an interactive map application that shows how different geographic areas will be invited to respond to the 2020 Census. Every household will have the option of responding online, by mail, or by phone. Nearly every household will receive an invitation; 95 percent of households across the nation will receive their census invitation in the mail and almost 5 percent will receive their invitation when a census taker drops it off at their home. The remaining less than 1 percent of areas, mostly remote, will be counted in person by a census taker instead of being invited to respond on their own. Each of these categories is a different TEA. The Census Bureau used the latest information on local characteristics to assign each area to a TEA; these TEA delineations were released to the public on February 1 during the Census Bureau’s quarterly 2020 Census Program Management Review. The assigned delineations are designed to maximize each area’s participation in the 2020 Census. The TEA Viewer allows users to explore the interactive map down to the census tract level to see what percentage of housing units are within each TEA. The TEA Viewer is a useful tool for analysis on which neighborhoods and sparsely populated areas can expect to see census takers during the public response phase of the 2020 Census. 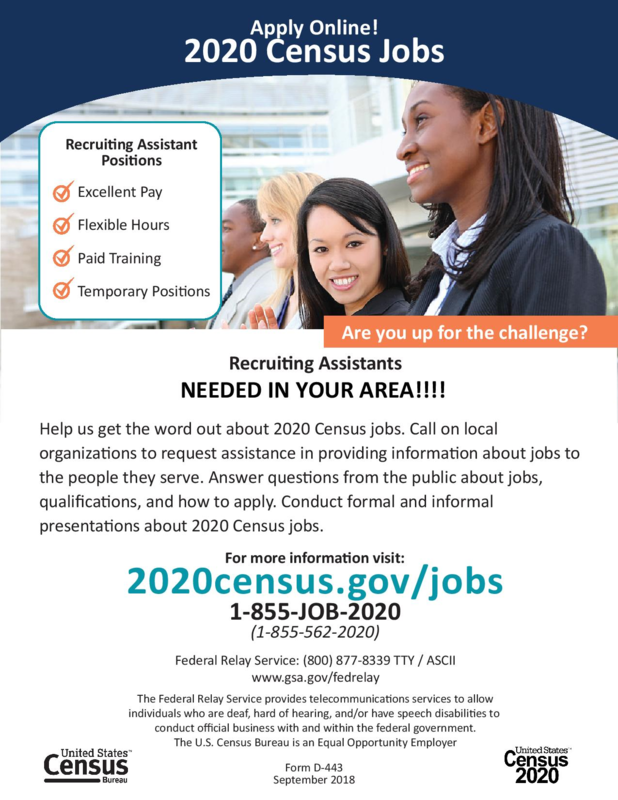 US Census is hiring for Recruiting Assistants throughout the state! Pay range is $16-$20 per hour no benefits. Positions will last until August 2020. For more information and to apply visit: www.2020census.gov/jobs.